On Tuesday 20 June two enthusiastic teams of Year 12 Chemistry students ventured off to compete in 2017RACI TITRATION STAKES in Resources and Chemistry Precinct at Curtin University of Technology between 5.00 - 8.00 pm. Each team had one and a half hours to complete all titrations, carry out all calculations and hand in result sheets. Both of our teams performed well and competed successfully with a high degree of accuracy. One team compromising Olivia Mocerino and Hayley Zeller achieved 11th place and will go on to complete in the National competition in August. “Thinking is impossible without any language” and “The law needs to recognise human rights and the fundamental interdependence of all biological (and some abiological) entities and their essential diversity” were just two of the topics tackled by Year Twelve students; Lila Rodari, Brittany Wassel, Emma Zanoli and Olivia Fudera in the annual philosophy event the Magis Carnival. 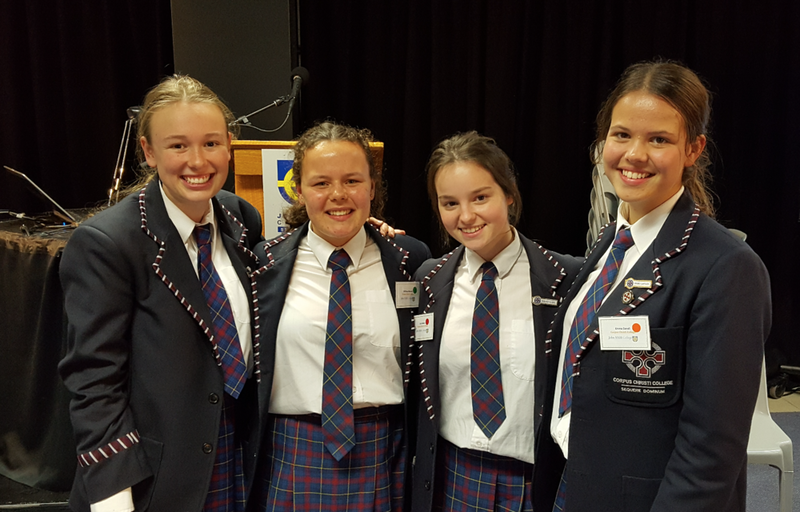 The Magis Carnival is an event run by Dr Annette Pedersen of John XXIII College, where students from different schools gather together for in-depth, challenging and mature philosophical discussion. It is not a competition, it is a chance for young minds to have meaningful dialogue in an environment surrounded by intellect, thought and critical thinking. Our students were split up into groups where they engaged in the philosophical talks with like peers from other schools. This event was not only a chance for them to practice their critical thinking, but meet students from other schools who, like them, are expressive, intelligent, and articulate. The sense of developing comradery was unmistakable. Brittany, Lila, Olivia and Emma conducted themselves with respect, enthusiasm and passion and by the end of the night were humming with positive energy. They found the other students fascinating and engaging and in the break, were proselytising about the merits of their groups. At the end of the night it was obvious that they had enjoyed their time and that the experience was engaging and revelatory. Mrs Filipa Carvalho our Head of Academic Excellence organised for our students to go and will be looking to find interested student to participate in the carnival next year. Congratulations to the girls for their outstanding efforts, and taking a break from their busy study schedules to participate in this amazing academic event. 16 June marked the end of an era for Badminton in Corpus Christi College. It was the final Badminton tournament that our Year 12 students would participate in, and so it was with bittersweet feelings that we journeyed to Kingsway to play other schools in a round-robin tournament. 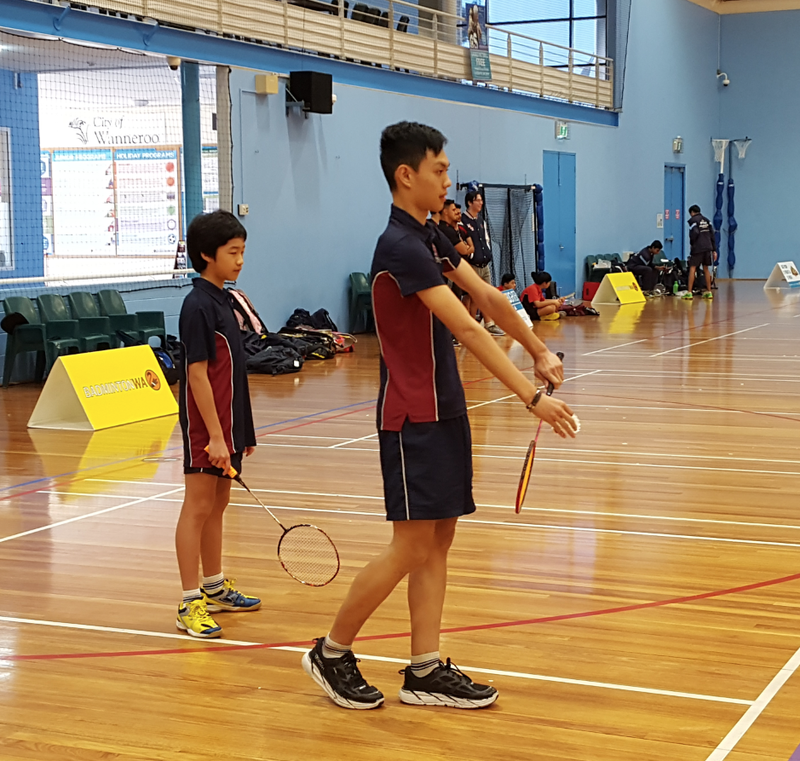 Many of the Year 12 students who played in this tournament have participated in Badminton since they were in Year 7 and, lead by assistant coach Matthew Teo have helped to build Badminton into a feasible and popular sport in the College. Their graduation at the end of this year will be noticeable and will leave a real and tangible dent in the soul of the sport in the school. In a difficult-to-miss prophetic coincidence, this tournament also saw the inclusion of one sole Year 7 student: Timothy Sentosa, who the Year 12 students have already dubbed: The Future Coach of Corpus Badminton. Together, he and Matthew made it all the way to the Semi-Finals of the tournament but were knocked out by two state players from All Saints' College. They played to a crowd of their peers who were especially enthusiastic in supporting their plays and while they did not progress to the finals, their efforts and the skills they displayed in the game – a palpable murmur of discussion was noted when Matthew almost went into the splits to make a shot - were a highlight of the day. As always, our students behaved impeccably and you would have to search long and far for another group of students who could display the same about of respect, comradery, enthusiasm and sincerity for each other and the sport. The students are to be congratulated for their outstanding efforts and their conduct during the day. This year the Year 10 students at Corpus Christi College will be participating in a unique reflective and personal growth experience. This experience is titled “Corpus Compass 10” or “CC10”. ‘Compass’ represents how, we at Corpus, embracing the Gospel values are called to set our compass in the right direction; directed towards God, and in doing so we grow as whole human persons who contribute positively to our community. CC10 will run over two days during school hours (Thursday 22 June and Friday 23 June) from 8.30am to 3.15pm. The cohort will be divided into two large groups and participate in two separate activities on each of the two days swapping over each day. Both days will be run by external providers ASPIRE (challenging leadership program) and ICEA (indigenous reconciliation). The goal the two days is for students to reflect on self, their relationship with God and how they can implement learning from these two days to Senior School application. Australia is lucky to have an innovative, active organisation like Skilling Australia Foundation, firmly focused as it is on the benefits VET brings to young Australians and the national economy. The Foundation is a determined advocate for VET, as is amply demonstrated by its recent report which tackles head on a series of widely held opinions that VET is junior league when it comes to tertiary education. VET graduates earn low wages. VET graduates struggle to find work. VET is a thing of the past. None of these is true, and with admirable ease the report debunks each of them. It’s not just in Australia we need to market the facts. Skillset and match, a magazine published by the European Centre for the Development of Vocational Training, reports that 87 per cent of VET students are happy with the work-related skills they developed, yet 1 in 3 European Union citizens do not think VET leads to well-paid or highly regarded jobs. Perhaps it’s time for an international campaign to reposition VET in the public sphere as a tertiary education pathway that holds great promise for all of us. Reconsidering career advice to students.